Independent film-maker Sayyed Nadeem Kazmi has been examining devotional rituals and symbols associated with the festival of Ashura. The tenth of Muharram is an important date in the Muslim calendar, but it is especially significant to the minority Shia Muslim sect as it marks the death of the Prophet Muhammad's grandson Imam Hussein. 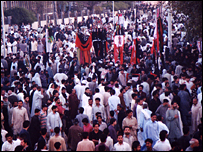 Sayyed Nadeem Kazmi's quest to find out what devotion to Hussein means for those who participate in the ceremonies is documented in his film Ten Days. Here, he explains why he thinks Ashura is yet to be properly understood. Hussein ibn Ali was the beloved grandson of the Prophet Muhammad through the Prophet's daughter, Fatima, and her husband, Ali ibn Abi Talib. Imam Hussein's martyrdom 14 centuries ago was a turning point in the history of Islam. It is a tragedy that resonates today among all Muslims, Sunni as well as Shia, for whom love for the Holy Prophet and his immediate family is an unwritten article of faith. But it is particularly important to the Shia who interpret Hussein's sacrifice as an enduring ethical and moral legacy from which all humanity can take lessons. Some years following the death of Muhammad, the temporal leadership of Islam turned away from its spiritual roots and became what many view as a corrupt dynasty. During the time of Hussein, Yazid bin Mu'awiya was de facto "king" of a now evolving Muslim military empire. For Yazid, it was essential that the blood descendants of Muhammad, whom he saw as his own family's historical enemies pledge allegiance to him. Yazid's own grandfather was Abu Sufyan, the most notable enemy of the Prophet, who embraced Islam only after several battles with and severe persecution of the Muslims. Hussein was a threat not only because he was the grandson of the Messenger of Islam but because he insisted on Yazid renouncing what he saw as the corrupt and cruel form of government that he believed had hijacked the pristine Islam of his holy grandfather. Both parties refused to yield and Hussein, along with about 70 of his kith and kin (which included women and children), was besieged at Karbala where an unprecedented massacre occurred at the hands of an army numbering thousands. During the 10-day siege, Hussein's camp suffered unimaginable tortures, including the cutting off of water supplies and the killing and wounding of infants. 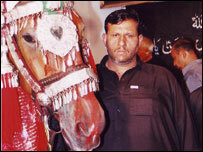 After losing his own children to Yazid's forces, Hussein was himself beheaded and his body mutilated. The few who survived were taken on foot to Damascus (some dying along the way) where Yazid's dungeons awaited them. It is said that many bystanders along the route recognised what had happened and began to beat themselves, some even weeping to death. This event was probably the beginning of the self-flagellation rituals we see today. According to tradition, the gatherings, wherein the tragedy is retold, go back to the conversations between the daughter of Hussein and the daughter of Yazid. I grew up with these Shia commemorations, which take place annually during the holy month of Muharram, which is the first year of the lunar Islamic calendar. Every year, I would be taken to the "majlis", or gathering, where the Tragedy of Karbala would be retold through poetry, rhythmic oratory, and passion plays, a tradition going back centuries. The immaculately robed cleric would recount the events chronologically and in great detail, eliciting an emotional response from the audience, many of whom wept uncontrollably. As he finished his sermon, the entire congregation would rise to their feet and begin beating their chests in an irresistible rhythm to the sound of nuhakhans, reciters of odes, that accompanied the self-flagellation. 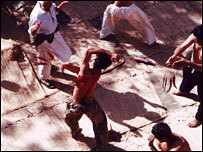 On the day of Ashura, a small number of men would form a circle and, taking off their shirts, whip their backs with curved blades hung together in bunches known as "zanjirs". It was these experiences that led me to recently produce a documentary film on these commemorations as I knew them. Thus, the making of Ten Days took me to Pakistan on an ethnological journey where I wanted to find out why men would slash their own backs in remembrance of Hussein's martyrdom, or the relevance of Zuljina, the horse, or how the standards that grace the processions are made. Ultimately, I wanted to know what devotion to Hussein meant for those that participated, every year, in these ceremonies. Whether a participant or not, one cannot avoid voyeurism, but I wanted to respond to what I considered to be the mythologising of these ceremonies, perhaps even their politicisation in the contemporary context. But, most of all, I wanted to capture the raw energy of Ashura in Pakistan with images that would both captivate and challenge audiences' perceptions and assumptions - whether Muslim or not. My film is therefore entirely in Urdu and Punjabi with English subtitles, purposely avoiding what I consider to be the intrusive element of a narrative. The film, like the processions, narrates itself. I believe Ashura has yet to be properly understood. It is an electrifying event, spectacular in every sense of the word, with a long historical tradition of poetry and prose in various languages. It has devotional rituals and symbols that are pregnant with meaning. In Sunni mosques, it is also commemorated but without the ritualistic aspects that are identified with the Shia. But perhaps what will continue to make it so interesting to the non-Shia is the way in which the Passion of Hussein continues to be rendered, with a vividness and dramatic immediacy that is visually stunning. To me, the remembrance of Hussein is a poetic reminder of both the depths to which humanity can sink - through the actions of Yazid - and the heights to which it can raise itself - through the example of Hussein, whose inspirational message today includes the slogan "Every day is Ashura and every place is Karbala". The evident self-violence, seen in its proper context, is an expression of nothing less than love for Hussein as the Prophet's grandson and both a recognition and identification with his struggle and sacrifice. Although many Muslims, including some Shia themselves, condemn the practice of self-flagellation, those who engage in it will tell you that the whole point is in fact about opposing violence. Such practices, while seemingly primitive, are also an essential part of religious devotion in other faith traditions, including Christianity and Hinduism. In making the film, this was one of the most important lessons I learned. And having seen the devotion of ordinary people to Imam Hussein, one cannot deny the impact of his message.